QPR v Sheffield Wednesday: what time is kick off, is it on tv and what are the odds? Sheffield Wednesday will be looking to continue their push up the Championship table when they travel to Loftus Road to take on QPR in their mid-week league match. The London side are currently in 18th place in the table after a rocky start to the campaign. Kick off at Loftus Road is at 7.45pm on Tuesday 23 October. The match is being shown on Sky Sports football on the red button and should be available to on iFollow Audio. How can I follow QPR v Wednesday live? You’ll be able to follow all the latest updates and team news on The Star website. 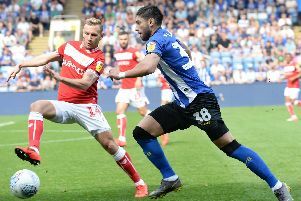 Sheffield Wednesday’s Sam Winnall is on the verge of returning to action for the first team after making a first-half appearance for the under-23s last week. The referee will be John Brooks, who will be assisted by Robert Hyde and Sam Lewis. The fourth official will be James Linington. Odds are not yet available for the match. What is the form of QPR and Wednesday? Jos Luhukay’s men come into the match unbeaten in four matches, having won their last outing at Bristol City. Wonderstrikes in back-to-back matches from Adam Reach, against West Brom and Leeds United, secured draws against their promotion rivals. QPR have had a small upturn in form after a mixed start to the campaign, drawing their last match against Derby County 1-1.